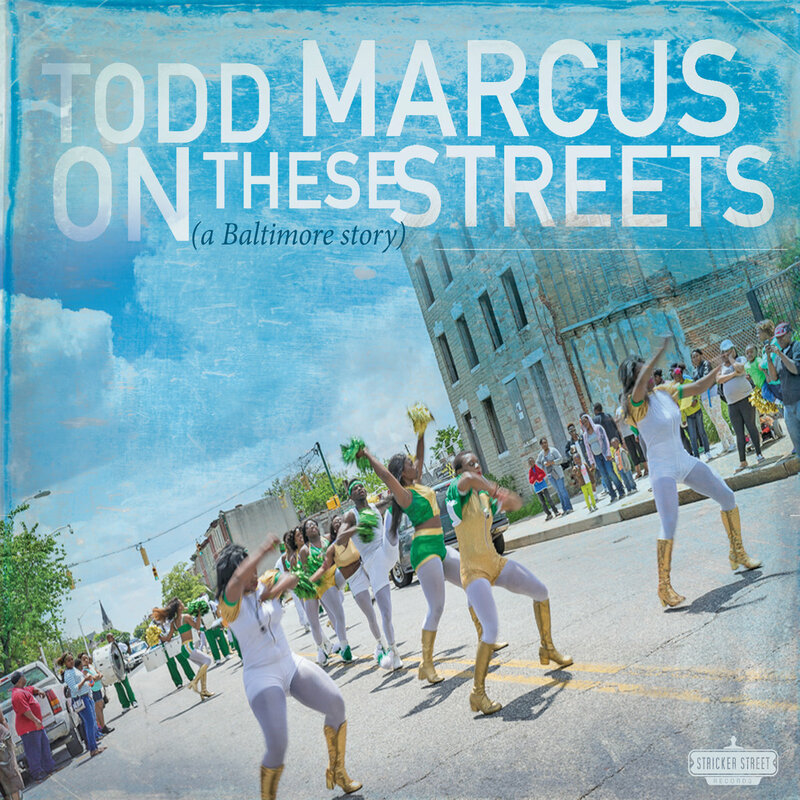 On These Streets is an unusual new release from bass clarinettist, composer and band leader Todd Marcus. It is a musical portrait of the run down Sandtown-Winchester and Upton neighbourhoods in Baltimore, previously the African-American entertainment hub of the city. Pennsylvania Avenue was once lined with theatres, clubs and concert halls where many of the jazz greats played. Marcus has lived and worked in this neighbourhood for the last 20-odd years. Anyone familiar with the TV series The Wire will be aware of the massive problems West Baltimore faces because of poverty: violence, underemployment, drug addiction and poor education. "…eliminated a major open air drug market, fully renovated six abandoned and dilapidated buildings, transformed 18 vacant lots into meditative community green spaces, created over two dozen neighbourhood murals and converted 96,000 sq./ft. of vacant lots into an urban farm. "The core of our work has been our programs including Martha’s Place which serves women overcoming substance abuse with housing and supportive services, Jubilee Arts which offers art and dance classes… and Strength to Love II which runs a farm… that provides employment to community members returning from incarceration." Marcus is also involved in organising Baltimore’s jazz community, what he calls his “jazz community service”, putting on weekly jam sessions with invited seasoned guest soloists together with younger and less established players. The CD comprises nine of his compositions, each describing a different aspect of the city, plus an arrangement of the hymn I Surrender All, a nod to the importance of the role of the church within the Sandtown community. These pieces are interspersed with audio glimpses of the neighbourhood – ambient street sounds, residents talking about their daily lives, a bit of a church service, and some street corner recordings. The band, who all have Baltimore in common, are extremely accomplished. Marcus’ music on this CD is straight-ahead jazz, swinging along with an urgency appropriate for portraits of the urban scene. The track Ground Zero, which is prefaced by a commentary recorded during an actual riot, is filled with intense, fast solos from the virtuosic team – pianist George Colligan, guitarist Paul Bollenback and Marcus himself on bass clarinet, backed by frantic drumming from Eric Kennedy and a non-stop rather disquieting bass line from Kris Funn. Marcus is of Egyptian-American heritage and there are occasional Middle Eastern tinges to his playing, for example in the first and longest track on the album, the lyrical and upbeat On The Corner. This track also showcases the prodigious piano playing of Colligan. On vibes is the splendidly named Warren Wolf, who is also a drummer and keyboard player. He is Baltimore born and Berklee trained. His lightness of touch and melodic invention are elegantly demonstrated in the tune, An Intersection Of Change – a tribute to the work of the non-profit organisation. The ensemble playing on this track of Todd, Wolf and Corrigan set against the nimble drums and sinuous bass is lovely. Some of the tunes pelt along, with furious runs, stop-start melodic lines and a driving beat – a musical depiction of desperation and anxiety. There is one ballad, the elegiac It Still Gets Still. It is introduced by the haunting sound of a far-off train, and depicts the peace of the city at night. Wolf plays a gorgeous solo here. Bass player Funn doesn’t get his solo until the final track NJ’88, but his fine playing is apparent throughout, particularly in the very agreeable Covered In Snow, where the musicians meander up and down in counterpoint to each other, with a crystalline vibraphone melody overhead, and deft drumming below. After a few listens I found myself skipping the non-musical tracks, except for the atmospheric train whistle, but these pieces provide useful context. It is unusual to have a band led by bass clarinet – the whole instrumentation is quite uncommon, but for me it works. The various combinations of bass clarinet and guitar, vibraphone or piano are very pleasing. Despite the tension and turbulence described, Marcus Todd’s ode to his Baltimore is ultimately optimistic. On the cheerier tracks, his melodies ascend expectantly, and resolve with a bright flourish. An interesting and informative album.